The scene was something like the photographs of Dust Bowl Oklahoma. But there was so much current reality around me, it made a jarring juxtaposition. Fifty feet behind me the SUVs, the pick-ups and the Greyhound size RVs roared past on the paved road. A few feet in front of me was a nearly extinct image from long ago days. It was a farmer’s corn stand. I sat at one of these when I was about ten years old. My grandmother lived on a small working farm in upstate New York. One afternoon, my parents, brothers and grandmother had someplace to go so they left me in charge of the vegetable stand. It was a plank held up by two barrels. I had baskets of fresh tomatoes, peaches, peas and corn. It was unbearably hot in the nearby fields, but I was comfortable in the shade of an ancient elm tree (it died during the Dutch Elm Disease epidemic of the 1960s). I didn’t want my folks to return and take command of my little retail world. The ’49 Fords would pull up and men with white tee-shirts and suspenders would get out and buy my grandmother’s goods. Once in a while a cute young girl would get out and ask for five tomatoes and a dozen ears of corn. I would impress her with my ability to quickly make change. I got to take a dozen ears home that night. Lord, that corn of yesterday was good. It wasn’t even the same species of what one buys at the local supermarket. The kernels popped in your mouth and the butter ran down your cheeks. I loved it with salt and pepper. Now, here it was in August of 2013. Again I was in upstate New York…this time very far north; near Canada. But there it stood and I braked made a sharp right turn and drove into the dusty parking lot. The stand was white with hand-painted prices, in black, on the wall. The cornfields were just feet away. The ears that were picked that morning were still in the field worker’s sacks. The price was very reasonable. While my wife bought three peaches and six ears of corn, I stood in the glaring sun and heavy hot air of mid-August. My straw hat did little to deflect the sun. I was looking around me and absorbing all the images. And I was watching the girls who were selling the produce. Here were two pretty teenage girls, in flip-flops and tee-shirts. One wore what looked like black spandex leggings. My own legs burned as I looked at her. Memories of my childhood, farms and corn. Then the 2013 reality check happened. Both girls were wearing wrap-a-round reflector sunglasses, like the kind the State Troopers wear. I saw one cell phone but no texting went on. No music played from the little radio I saw inside the stand. Less than ten miles away was the County Fair, in full progress. I felt they would rather be there at the Fair with their boyfriends and eating cotton-candy and riding the whirly rides. But, no. Here they spent the day, selling what was probably was their parents produce. They sweated as they would dump the corn sacks onto the table. One woman customer bought three dozen ears. My wife went back to our car. I waited for the woman to take her thirty-six ears and depart. 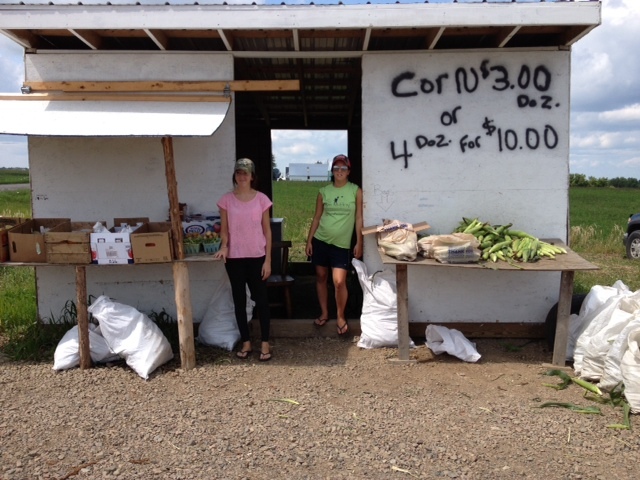 I stood facing the white stand and the piles of corn, stacks of peaches and the girls. I came forward and asked if they would stand in the doorway and pose for a photo. They looked at each other with puzzled expressions. I stood there, a gray-haired man. How would they know I sold corn once? It was a smaller stand and it was over fifty-five years ago. They could never know that about me. They did. My wife and I drove home. The County Fair Talent Show was set for 7:30 that night. Surely these two girls had talent. But I worried whether they could get home, shower and get ready to sing a country song like John Denver’s “Country Roads” or perform a jazz dance. Yes, surely these girls possessed talents I couldn’t see in the glare of the afternoon sun. I didn’t make it to the Talent Show. I was too busy sharing our corn at a dinner with friends. By God, that corn was good! This entry was posted in Holding onto the Past and tagged childhood, cornfields, farm vegetable stands, fresh corn, grandmothers farm.